In a world where Facebook and Twitter dominate the headlines, it’s easy to forget that other social properties, like Reddit still send a ton of traffic to sites. But they absolutely do, and now you can buy your way into that. 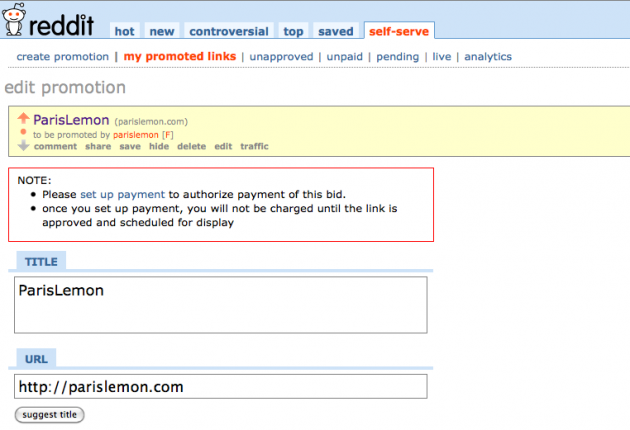 Starting today, Reddit is testing out a new closed beta experiment to allow anyone to purchase a sponsored link on Reddit’s homepage. Yes, that means you, not just some random advertiser. And not just the homepage, it’s the top overall link. Now, obviously, this link will be clearly labeled as “sponsored,” but that shouldn’t make it that much less of an enticing opportunity for some individuals who want to drive traffic to their site. Reddit says it sees anywhere from a 2% to a 10% click-through-rate on the ads that run in this area. At the very least, this should mean thousands of hits coming to your site that wouldn’t otherwise get. So what’s the catch? The only catch is money. As long as you’re willing to pay the minimum of $20 a day, Reddit will enter you into a pool with everyone else willing to pay to determine how much face time you’ll get on the homepage. For example, if the total bids for the day equal $200, and you bid the minimum $20, you’ll get 10% of the day in this ad slot. It seems very likely that the daily bids are going to be quite a bit more than that, so $20 probably isn’t going to buy you much, but still, it will get you something. With this beta, there won’t be the ability to target specific Reddits (the Politics Reddit, for example), but the plan is to eventually offer that option to better match individual advertisers with the audience they are trying to reach. Adding your own self-serve ad is as easy as can be. Once you’re accepted into the beta, you simply fill out a title for you link, enter the URL, put in the duration that you wish to run your campaign, optionally disable comments, put in your bid amount, and then upload an image (if you choose). You then pay by entering your credit card information into a form. What’s great is that just like regular Reddit items, users will be able to vote up or down on your ad, which means that if your content actually is good, you can even appear on the homepage for longer than you’ve paid for. The company notes that users have tried to game the system for years attempting to get traffic, so this is a logical extension to allow them to pay to get it. It officially unveiled sponsored links for advertisers (big name ones) in January. Reddit’s main competitor, Digg, also has a advertising voting system, but so far, it’s only open to Digg’s advertising partners, not anyone willing to pay. Assuming they put guidelines in place (which Reddit has), it’s not hard to see this type of model eventually making its way to Digg as well. Reddit’s founders, Steve Huffman and Alexis Ohanian, recently left the company three years to the day after Condé Nast purchased them. But they’re still clearly involved, as we spoke with Ohanian about this new launch, and he seems pretty excited about it. As a part of the launch, Reddit has given us some invites to give to TechCrunch readers to check out the self-serve advertising system. The first 50 people to email MArrington [at] reddit .com will receive the invites.